Some dogs lose control of their bladders when they greet people, either family members or strangers. This is different from other housebreaking problems. It is called submissive urination by dog behaviorists. It is a normal canine greeting behavior. A dog who does this has no conscious control over his urination at the time. This is a common behavior in puppies, and usually goes away as they mature. Some dogs are as old as two years before they stop submissively urinating. 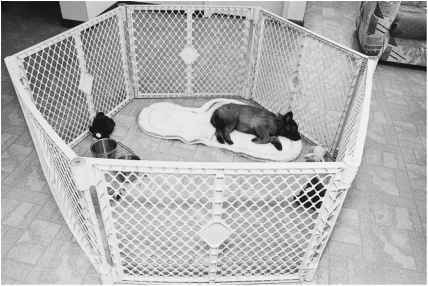 Rarely it may persist in some dogs throughout their lives. Submissive urination can be a difficult problem to solve, but there are some things you can do to help. First of all, because your dog has no conscious control over it, punishment will certainly not help. In fact, it will make things worse because the punishment will increase his submissive behavior. Even a slightly raised voice to a dog with this problem will cause him to urinate submissively. The best thing to do when this happens is to simply ignore it and clean it up. If your dog urinates in excitement when you arrive home, make your arrival as calm and matter-of-fact as possible. When you get home, try not to talk to him for the first five minutes. Of course, try to greet your dog outside to eliminate cleanup. You might also try distracting your dog with a treat or by throwing a ball if he is a compulsive retriever. The best thing you can do for this problem is to build your dog's confidence. Take him to different places and let him meet as many people as possible. Attending an obedience training class is a great way to do this. Your dog will get exposure to a different place and to people and other dogs. Bring a roll of paper towels to the first few classes in case of accidents. 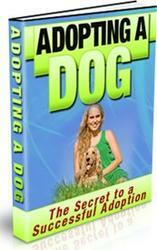 Discover The Secrets To Successfully Adopting A Dog! Never Before Revealed Information! You love dogs-- and you want a dog! Many people feel exactly the way you do! This is certainly no surprise, because dogs are wonderful animals and they make excellent pets. A dog can bring lots of fun, friendship, and joy to your life!